Anyone who knows me, knows I love the Arizona Cardinals and live for the NFL. If you love football & the NFL, then you loved watching Max Hall make his first ever NFL start yesterday against the world champion NO Saints. His performance left everyone (including me) sayin “Who Dat?” Keep it up Max and I will be owning a #6 jersey really soon!! 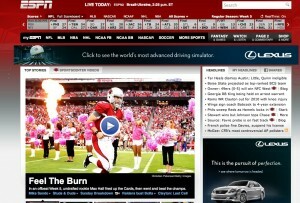 It was awesome to see him on the front page of ESPN.com this morning (screenshot below). Well deserved Max!